Kenyan teacher, novelist, essayist, and playwright, whose works function as an important link between the pioneers of African writing and the younger generation of postcolonial writers. After imprisonment in 1978, Ngugi abandoned using English as the primary language of his work in favor of Gikuyu, his native tongue. The transition from colonialism to postcoloniality and the crisis of modernity has been a central issues in a great deal of Ngugi's writings. Ngugi wa Thiong'o was born in Kamiriithu, near Limuru, Kiambu District, as the fifth child of the third of his father's four wives. At that time Kenya was under British rule, which ended in 1963. Ngugi's family belonged to the Kenya's largest ethnic group, the Gikuyu. His father, Thiong'o wa Nducu, was a peasant farmer, who was forced to become a squatter after the British Imperial Act of 1915. Ngugi attended the mission-run school at Kamaandura in Limuru, Karinga school in Maanguu, and Alliance High School in Kikuyu. During these years Ngugi became a devout Christian. Later he rejected Christianity, and changed his original name in 1976 from James Ngugi, which he saw as a sign of colonialism, to Ngugi wa Thiong'o. After receiving a B.A. in English at Makerere University College in Kampala (Uganda) in 1963, Ngugi worked briefly as a journalist in Nairobi. He married in 1961. Over the next seventeen years his wife, Nyambura, gave birth to six children. In 1962 Ngugi's play THE BLACK HERMIT was produced in Kampala. In 1964 he left for England to pursue graduate studies at the Leeds University in England. As a novelist Ngugi made his debut with WEEP NOT, CHILD (1964), which he started to write while he was at school in England. It was the first novel in English to be published by an East African author. Ngugi used the Bildungsroman form to tell the story of a young man, Njoroge. He loses his opportunity for further education when he is caught between idealistic dreams and the violent reality of the colonial exploitation. The most prominent theme in Ngugi's early work was the conflict between the individual and the community. THE RIVER BETWEEN (1965) had as its background the Mau Mau Rebellion (1952-1956). The story was set in the late 1920s and 1930s and depicted an unhappy love affair in a rural community divided between Christian converts and non-Christians. A GRAIN OF WHEAT (1967) marked Ngugi's break with cultural nationalism and his embracing of Fanonist Marxism. Ngugi refers in the title to the biblical theme of self-sacrifice, a part of the new birth: "unless a grain of wheat die." The allegorical story of one man's mistaken heroism and a search for the betrayer of a Mau Mau leader is set in a village, which has been destroyed in the war. The author's family was involved in the Mau Mau uprising - Ngugi's older brother had joined the movement, his stepbrother was killed and his mother was tortured. Ngugi's village suffered in a campaign. 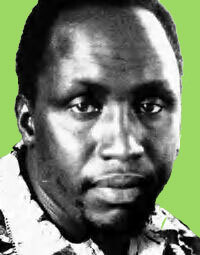 In the 1960s Ngugi was a reporter for the Nairobi Daily Nation and editor of Zuka from 1965 to 1970. He worked as a lecturer at several universities - at the University College in Nairobi (1967-69), at the Makerere University in Kampala (1969-70), and at the Northwestern University in Evanston in the United States (1970-71). Ngugi had resigned from his post at Nairobi University as a protest against government interference in the university, be he joined the faculty in 1973, becoming an associate professor and a chairman of the department of literature. It had been formed in response to his and his colleagues' criticism of English - the British government had made in the 1950s instruction in English mandatory. Ngugi had asked in an article, written with Taban lo Liyong and Henry Owuor-Anyumba, "If there is need for a 'study of the historic continuity of a single culture', why can't this be African? Why can't African literature be at the centre so that we can view other cultures in relationship to it?" (from 'On the Abolition of the English Department', 1968) Acknowledging the influence of European literatures on African writing, Ngugi and his coauthors emphasized the importance of the oral tradition, Swahili literature, and the Caribbean novel and poetry. "We have eyes, but we don't see. We have ears, but we don't hear. We can read, but we don't understand what we read." In 1976 Ngugi chaired the cultural committee of the Kamiriithu Community Edcational and Cultural Centre, a collective that a ran a public theatre. The government denied its permission for performances in 1982. At the end of December 1977 Daniel arap Moi, then vice-president, ordered Ngugi detained in Mamiti Maximum Security Prison. Ngugi was imprisoned under Public Security Act for a year without trial for his involvement with a communal theatre in his home village. Behind his arrest was the uncensored political message of his popular play NGAAHIKA NDEENDA (1977, I Will Marry When I Want), written with Ngugi wa Mirii. Also Ngugi's novel, PETALS OF BLOOD (1978), drew attention with its keen sense of contemporary political events. It reflected change in Ngugi's work from portraying the colonial era to reflecting the exploit and corruption in present-day Kenya. The story focused on an investigation of the murder of three representatives of the new society, who have profited from neocolonialism. The short story 'Minutes of Glory' examined the backside of economic progress - the life of women who were teared off from their villages and doomed to work as prostitutes in cities. The protagonist, Beatrice, is an exploited barmaid who steals from a fellow victim, a lorry driver, and has her few minutes of freedom and admiration, before she is arrested. After being released, Ngugi was not reinstated in his university post, and his family were subjected to frequent harassment. In 1980 Ngugi published the first modern novel written in Gikuyu, CAITAANI MUTHARA-INI (Devil on the Cross). He argued that literature written by Africans in a colonial language is not African literature, but "Afro-European literature." Writers must use their native languages to give the African literature its own genealogy and grammar. Ngugi's prison diary DETAINED, written in English, appeared in 1981. He left Kenya in 1982 to live in self-imposed exile in London. In his book DECOLONISING THE MIND: THE POLITICS OF LANGUAGE IN AFRICAN LITERATURE (1986) Ngugi wrote that African writers should express themselves in indigenous languages in order to reach the African masses. Among Ngugi's most important works is MATIGARI (1987), in which the author builds his narrative on a famous Gikuyu folktale. In the satirical moral fable Martigari, a freedom fighter, emerges from the forest in the political dawn of post-independence Kenya. Searching for his family and a new future, he finds little has changed and vows to use force of arms to achieve his true liberation. According to a rumor, Matigari was taken seriously by Kenyan authorities as a revolutionary agitator plotting to overthrow the government, and a warrant was issued for his arrest. Ngugi became in 1992 professor of comparative literature and performance studies at New York University, where he held the Erich Maria Remarque Chair. He has taught at the University of Bayreuth and the University of Auckland, New Zealand; and Yale, Smith, and at Amherst.